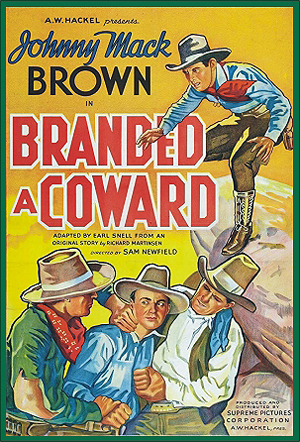 BRANDED A COWARD (1935, Supreme) Johnny Mack Brown, Billie Seward, Syd Saylor. As a boy, Johnny witnesses the massacre of his family by outlaws, but he does nothing even though he held a gun in his hand. Years later he is known as a coward until a bandit called, “The Cat” comes to town. 16mm. LAWLESS LAND (1936) Johnny Mac Brown, Louise Stanley, Ted Adams. Adams, a supposedly proper citizen, is really the head of a criminal gang. He’s soon responsible for the murders of the sheriff, a doctor, and the father of Johnny’s girlfriend. Johnny comes gunning. 16mm. TRAIL OF VENGEANCE (1937, Republic) Johnny Mac Brown, Iris Meredith, Warner Richmond. JM aids ranchers in a bloody range war with Richmond’s gang. The scene where Johnny shoots his way out of Richmond’s saloon is a gem. A great shoot-out highlights the film’s climax. 16mm. HELLTOWN (1937, Paramount, aka BORN TO THE WEST) John Wayne, Johnny Mack Brown, Marsha Hunt, Monte Blue, Alan Ladd. Wayne plays a roaming cowboy who rides into town and steals Brown's gal. The two become fast friends though, after Wayne stops rustlers from stealing Brown's cattle, and Brown exposes the card shark who cheated Wayne. A superior "B" Western with a great cast.